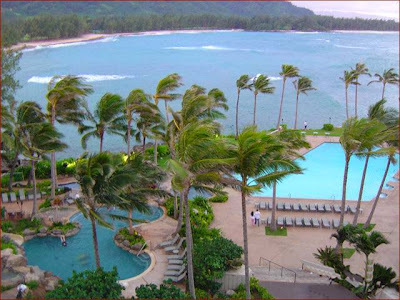 The Turtle Bay Resort on Hawaii’s North Shore in Oahu is the ideal spot for a three-day weekend getaway especially if you live in Los Angeles, like I do. We booked a 850 square foot beach cottage and it was scrumptious. It featured an amazing ocean view/access, private lanai, king-size bed, jacuzzi-tub, plasma TV, wet-bar and great sound system. We flew United from LAX to Honolulu International Airport in Oahu. the flight was about five hours. Arrived at Honolulu Airport , rented a car at Advantage. Drove the scenic hour and a half ride to the North Shore, and checked into our beautiful cottage just in time for the Friday night luau. Relaxed in the jacuzzi tub with a glass of Moet with a splash of chambord and some complimentary island fruit the hotel delivered to our door when we checked in. Went to bed and fell asleep to the rhythmic sound of the crashing waves outside. Flew home relaxed and energized.